Jen’s Mushroom & Thyme Truffled Grilled Cheese Sandwich with baby reds, onion, sharp cheddar, watercress, freshly cracked black pepper on Tuscan garlic bread. Jen, being my niece. A food enthusiast. Creative soul. Inspiration. 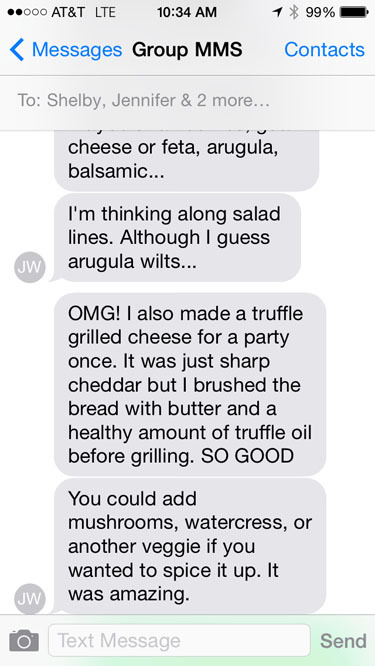 I sent out a text alert to my favorite foodies. Okay kids, I need some grilled cheese recipe inspiration. I knew I could count on them. My phone lit up with inspiration. Well there you have it. My work here is done…. Other than to serve it up. We wanted mushrooms to be the star, and where there are mushrooms there should also be thyme. Sliced baby red potatoes and thinly sliced onion assumed their role as ‘another veggie’. Tossed in olive oil and oven roasted until almost crispy. I had to slap hands away from these….who needs potato chips?!! I gave good consideration to what kind of bread would compliment the well selected ingredients of our Mushroom & Thyme Truffled Grilled Cheese Sandwich. Tuscan Garlic Bread nearly jumped out of the bakery case. When I sliced it and found whole garlic cloves I promise I heard the sound of harps playing in the distance. We brushed that gorgeous bread with butter and truffle oil before pan grilling and loading our sandwich. Can’t you just see the flavor in this sandwich. Here is my recipe inspiration team. Preheat oven to 375 degrees. Toss mushrooms, potatoes, onion, and thyme in olive oil, salt & pepper. Spread in a single layer on a baking sheet. Bake for 10 minutes, turn mushrooms and potatoes and bake another 5 minutes or until golden and slightly crispy. Heat skillet over medium heat. Brush bread slices with butter and truffle oil. Place in pan and top with shredded cheddar, roasted veggies, and more cheddar. Pan grill until golden brown. Top with fresh watercress and freshly cracked black pepper. Excellent served with a side of tomato veggie soup. Thank you for sharing! I was looking for the perect truffle oil grilled cheese and this is it. Im going to make it and feature it on my insta, @martinachunskitchen! You should vheck it out (: I would love to tag you for the recipe credit if you have instagram! Oh Becca, you are definitely part of my inspiration! !